The stock market went ripping higher on Monday, with the bulls hoping they set the tone for a strong week to come. What do our top stock trades of the day have to say? We just talked about this one last week, cautiously noting that Nvidia (NASDAQ:NVDA) shares were trending higher but risked falling back to its range lows near $130. In that same layout we said range resistance was near $160. Who would’ve known that Nvidia would rally north of 7% after outbidding Intel (NASDAQ:INTC) on Mellanox Technologies (NASDAQ:MLNX) for $6.9 billion? With the rally NVDA is up over $160, but it’s not out of the woods yet. We’ve seen the stock stall out a few times just above this level. If we can get some continuation on Tuesday (up over $165) or just a few days of chop/drifting higher and staying over $160, it could setup for a larger rally. If Nvidia begins to rally, it’s got the 61.8% Fibonacci retracement of the 52-week range at $188, while the gap fill up near $198. 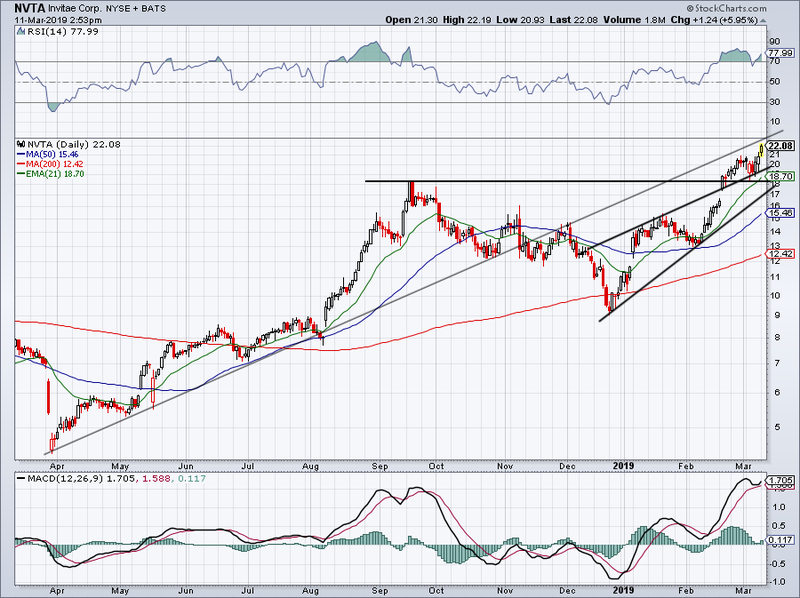 That would be a solid target if Nvidia can get some momentum. 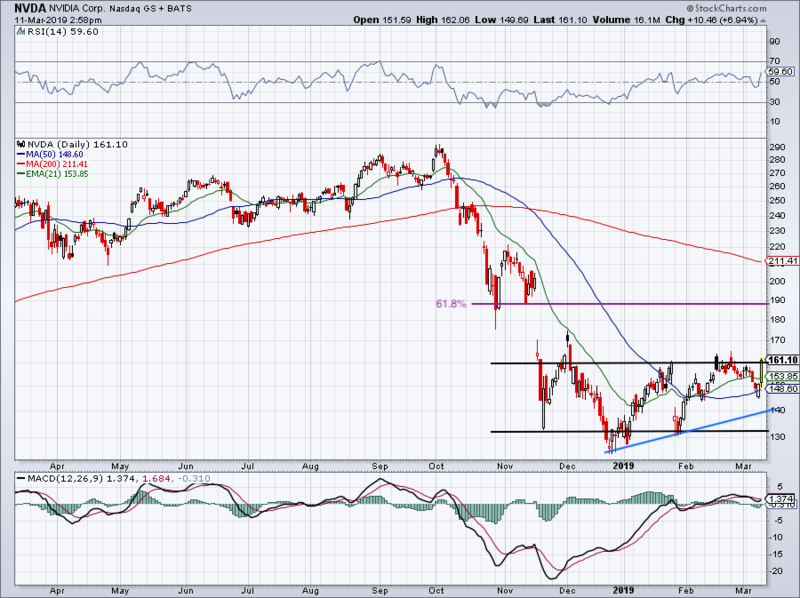 Not all that long ago, we pointed out the very tight consolidation pattern Apple (NASDAQ:AAPL) was holding in. It flirted with several breakouts over the $175 to $176 level, but never really got going. Then on Friday, it gave us a false breakdown, opening below the 21-day moving average and short-term uptrend support. It closed higher on the day, but not without giving us a fright first. That’s why the close is Oh. So. Important. Then we got our 3.3% rally on Monday. I would love to see this name fill the gap back up to $185 and touch its 200-day at $189, then digest. Rallying almost 3% on the day, Coca-Cola (NYSE:KO) bulls are happy to see some positive momentum. The move is thrusting KO back over the 200-day and 21-day moving average. My concern would be a strong/neutral open on Tuesday that goes south as the day wears on, as sellers line up and dump on KO into possible resistance. 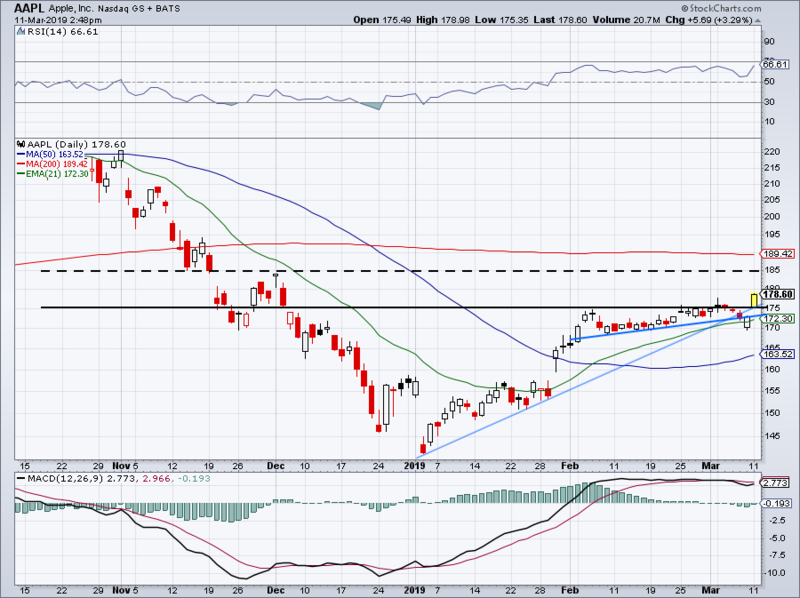 Over $46.50 though and I feel that KO is making a stronger bullish move. The MACD and RSI (blue circles) still have a lot of room to run if this name can gather some momentum. 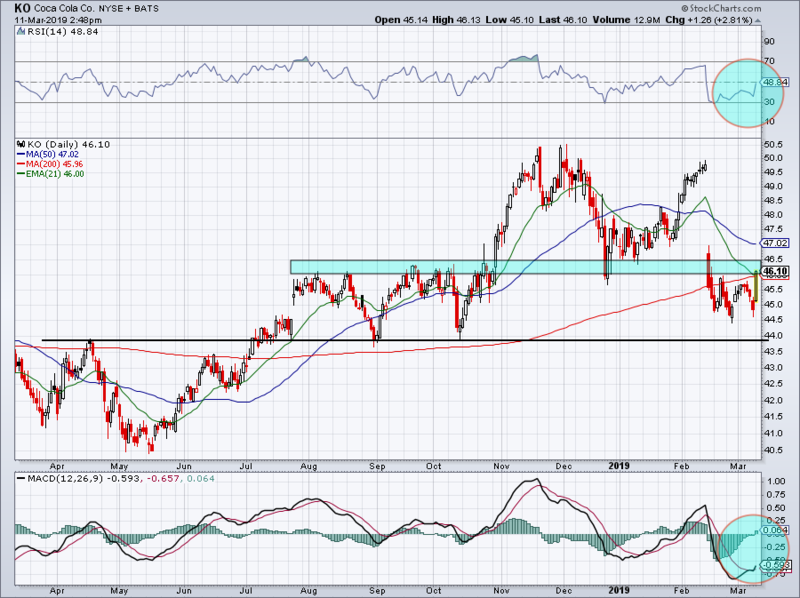 If resistance kicks it down, look for support down near $43.90 to $44.50. Invitae (NASDAQ:NVTA) has been such a beast since we flagged its breakout near $15. After tagging $21, the company announced a secondary, which temporarily weighed on the stock. However, investors gobbled up every last share (and then some) and this name is back to hitting new highs. Nearly all of its trends (long term and short term) are from the lower left to the upper right, making this a prime buy-the-dips candidate. Look for a dip into recent uptrend support, with the 21-day trailing just behind. Keep in mind this name is overbought, but it’s got strong momentum in its sails. Bouncing hard off its lows, Boeing (NYSE:BA) stock suffered a nasty gap down from news of a fatal crash over the weekend. Shares were lower by more than 11% in early trading, but the stock has erased most of those losses. 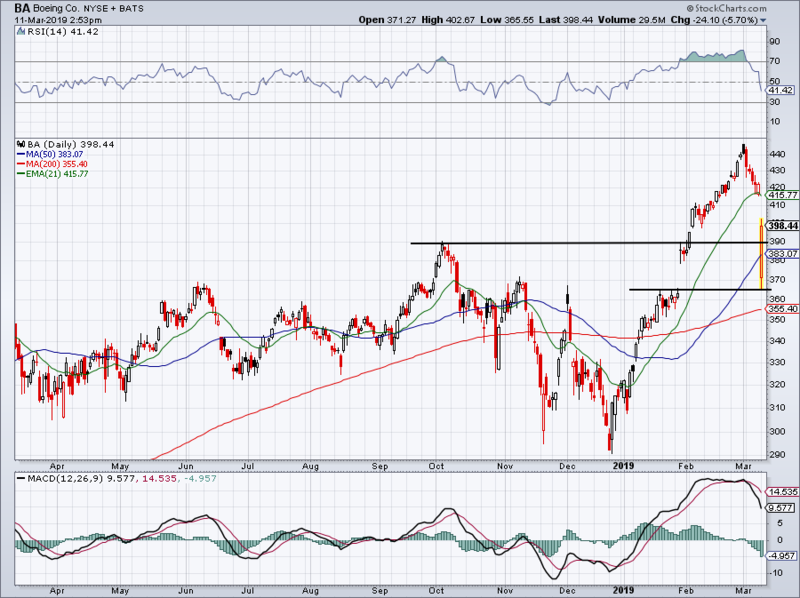 After filling its January gap, BA promptly rallied through its 50-day moving average and $390. A close over $400 would be most ideal. Short-term bulls who bought the morning lows may consider taking profits, but at the very minimum, we want to see this one stay north of $390 and the 50-day. Below the latter and BA could revisit Monday’s lows. Bret Kenwell is the manager and author of Future Blue Chips and is on Twitter @BretKenwell. As of this writing, Bret Kenwell is long NVDA, AAPL, NVTA and BA. Article printed from InvestorPlace Media, https://investorplace.com/2019/03/5-top-stock-trades-for-ba-nvda-nvta-ko-aapl/.